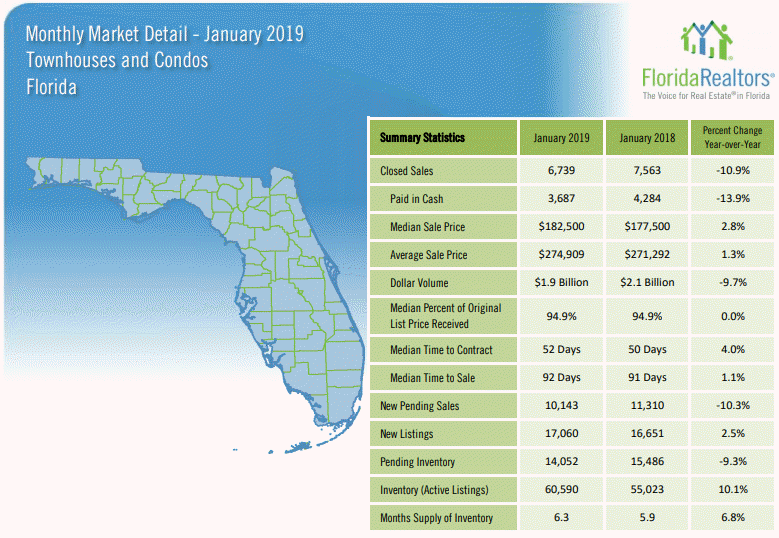 The Florida Townhouses and Condos Market Report for January 2019 had weaker sales activity when compared to last January. Closed sales were down by 10.9% as compared to last month’s decrease of 11.4% and new sales under contract (new pending sales) decreased by 10.3% (In December there was a 12.6% decrease). Prices, however, continue to rise for January though at a much more reasonable pace than most of last year. Median sales prices were up by 2.8% (was up by 2.8% in December), while the average sales price increased by 1.3% (was up 0.8% in December). The inventory of active listings increased by 10.1% from January of last year. We now have 6.3 months of inventory as compared to 5.9 months for January 2018. Now in a balanced market for Florida townhouse and condo sales. A balanced market favoring neither buyers or sellers is considered to be one with a 6 to 7 month supply of inventory. To view the latest set of reports from Florida Realtors for the state of Florida, Martin County, and Saint Lucie County, please visit GabeSanders.com and select Market Data. Market information is courtesy of Florida Realtors Research. For additional information and historical archives please visit the Florida Realtors Research page.